We just got back from a magical journey. A journey along the old Silk Road where gold and spices and jade and ivory and carpets and rhubarb and tea (and, of course, silk) was carried by caravans of camels in the centuries from the time of Alexander the Great to the time of Kubilai Khan, the great Mongol emperor of the Yuan dynasty in China. The Silk Road extended from Constantinople, the Capital of Byzantine Rome, to Chang-An, the Capital of T’ang China (modern day Xian). Along the way it crossed some of the most stark and dangerous terrain on earth and some exotic oases towns that had a culture straight out of the Arabian Nights. One such town was Samarkand in modern day Uzbekistan. We spent two days here drinking in its amazing history and the monuments left behind by one of its greatest rulers, Timur Lang (or Timor Lane as he is sometimes called in the West). Arab – briefly part of the Caliphate after muslim conquest in eighth century. Mausoleum Inscriptions. 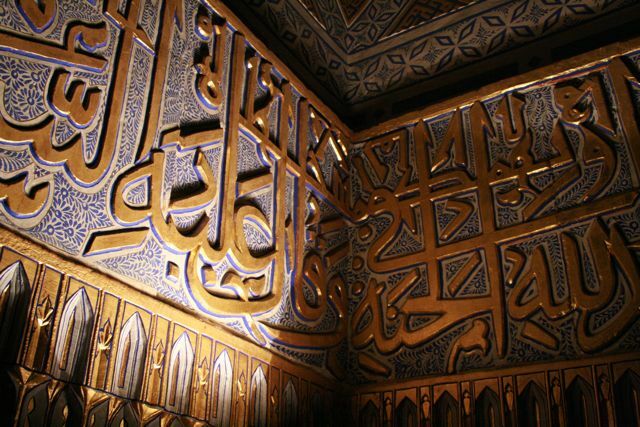 Most people in Samarkand, including emperor Timur could not read these as they were illiterate. Created by Persian and Indian artists. Timur Lang’s monuments define Samarkand today. They have been restored somewhat from the ravages of time and violent cultures since the 14th century when they regally dominated the Samarkand skyline. 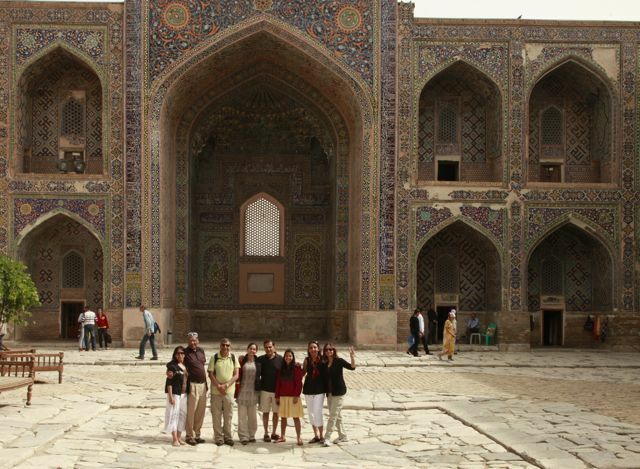 See an annotated Slide Show of Samarkand here. Timur ruled from 1370 – 1405. He saw himself as Genghis Khan’s heir and was a great conqueror in the Mongol tradition: a brutal destroyer, sacker and looter across Asia. But he was also a builder of a beautiful city and a patron of the arts. In 1404 he lost his favorite grandson in a battle and was devastated. Timor, the murderer of more than a million people, is said to have cried for two days. 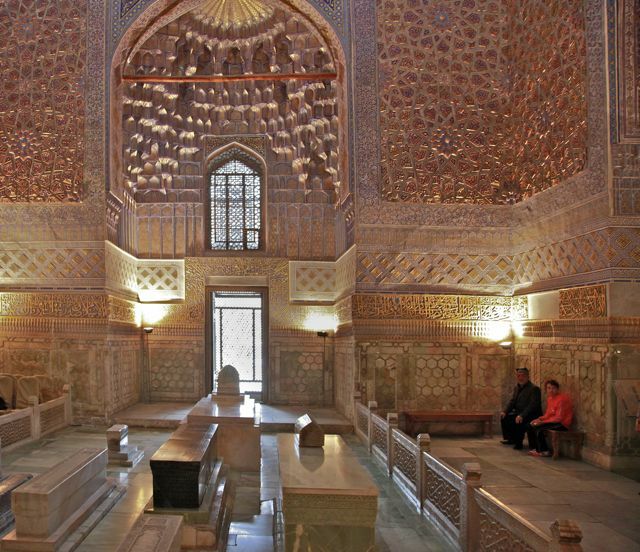 He built this mausoleum in memory of his grandson. He is buried here too along with his other descendants. We learned of a famous curse attached to opening Timur’s tomb: A sign was carved on it warning that whoever would dare disturb the tomb would bring unspeakable horror onto his land. The tomb lay unopened for 500 years. On June 19, 1941 a Russian expeditionist, Mikhail Gerasimov, opened the tomb. Three days later he learned of the Nazi invasion of Russia which resulted in 30 million Russians being killed! 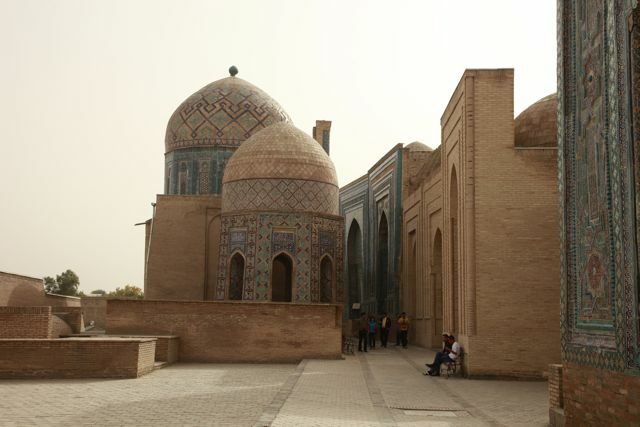 This was the center of the city of Samarkand, built in desert motifs and consisted of places of worship and public discourse. It was a great bustling place with colleges teaching philosophy, math and astronomy as well as a silk route bazaar with eclectic wares from across Timur’s empire – from India to Persia and beyond. Timur built this mosque in memory of his wife, Bibi Khanum, in 1399 after he returned from his Indian campaign, where he sacked and looted Delhi, India, because “the sultanate there was too tolerant toward its Hindu subjects”. He brought back more than 50,000 prisoners and 95 elephants who helped build this mosque with Indian architectural elements. Timur’s great grandson, Babur conquered India in 1526 founding the Moghul dynasty which ruled until 1847. A huge stone Koran dominates the center of the square. The whole complex is being restored with Russian assistance, a process that began in Soviet times. This is a beautiful necropolis not far from the Bibi Khanum mosque, where legend has it that Kusam ibn Abbas, prophet Mohammed’s cousin is buried. He came to Samarkand in the seventh century to preach Islam and was murdered by the Zoroastrians. His tomb was regarded for a long time as a pilgrimage site, equivalent to Mecca for those who could not afford the journey to Arabia. 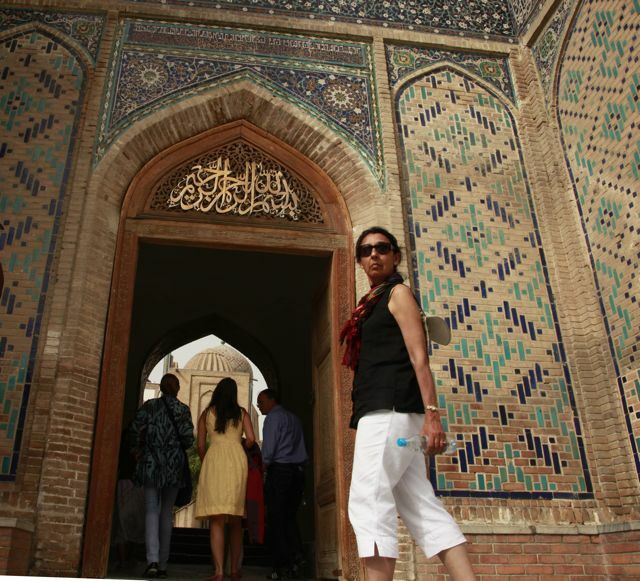 The complex has the distinctive blue color of Persian architecture, mosaic work inlaid with precious stones and ornate mosques (somewhat against the Islamic injunctions to keep it simple). 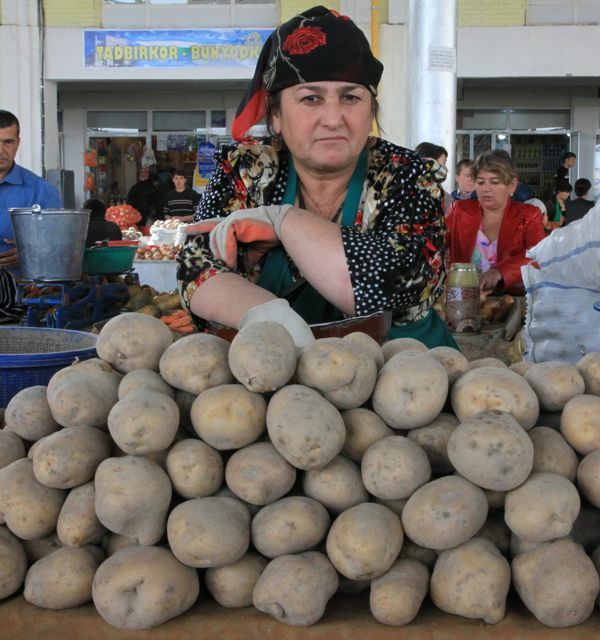 A bustling market of delights in Samarkand. 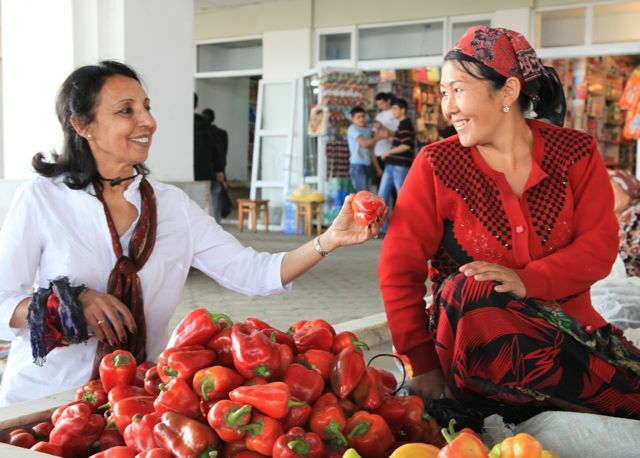 Colorful dresses, scarves and headwear distinguish the vendors of fruits, vegetables, almonds and black sweet raisins. Here you are transported back to the days of the Silk Road. Local wares include fruits from the orchards of this oasis and fine fabrics, stone and metalware. The bazaar was modernized by the Soviets ridding it of all its cultural charm. 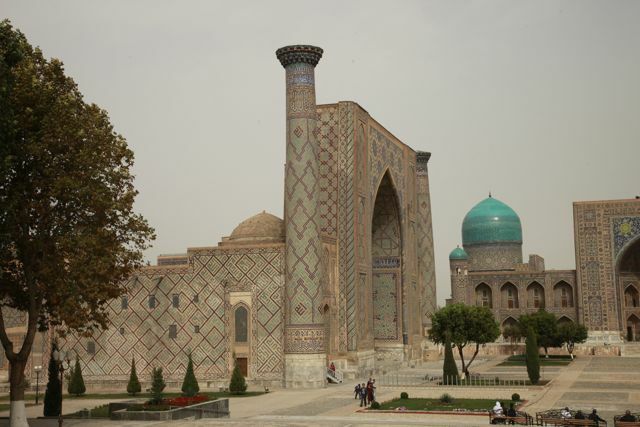 All in all a hidden gem of a city to visit – in the middle of a forgotten Central Asia. 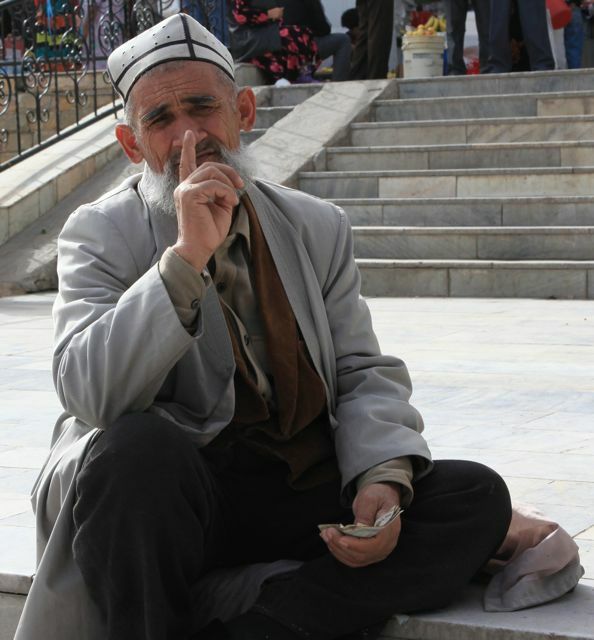 See a complete slide show on Samarkand here. Fantastic. Learnt a very interesting history lesson. Great slide show. Ashok, you just amaze me. Thanks, Anil. Those huge bagles are filled with sugar. Gained 5 lbs. The Genghis Khan hat allowed you to loot at will and carry off young maidens – alas, no longer. in the Time Machine to visit the famous Old Silk Route. I had read so much about it and never thought that someone so close to us will actually visit this place. Hats off to you. I never thought that you who are a genius of Science and Master of Computer science will produce such fine article with these wonderful photographs. I feel proud that I know some one so closely (that is you) with these qualities. Heartiest congratulations. Thanks, Bhupendra Uncle. I love your feedback. What a great trip, Ashok! 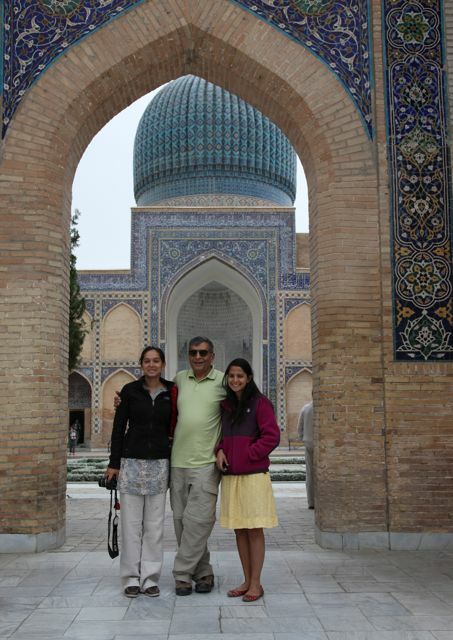 Kalyan and I have always wanted to visit the Silk Road, Samarkand, the Fergana Valley. Not sure how many of these sites are accessible. Be prepared for a lot of questions from us! Hi Parvati. Thanks. The SIlk Road, Ferghana Valley etc are all accessible. You need visa which take 3 months sometimes. Uzbekistan is particularly sticky and requires that you show them where you stayed each night before you can leave! We also went to the Torugart Pass, Kyrgyzstan, Kashgar in China and Silk Road cities such as Dunguang near the Gobi desert. Maybe a future post. Ashok, as usual great narration, very informative. Pictures are great, I like the modern day Genghis Khan hat! 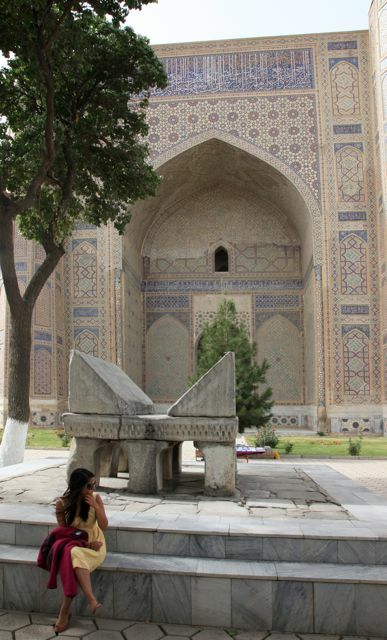 Your blog captures the sights and the spirit of Samarkand exceptionally well. I am back to where we started three weeks back! Hats off to you. It was a great trip. Memories will be everlasting. You guys are a part of them. Thanks for sharing your blog. Through your inimitable narrative and vibrant pictures you transport us back six centuries to a remote part of Central Asia with its historic ties to the Mogul Empire through Babur. The thrill of walking on the Silk Road and taking the camel caravan in the desert is palpable even to us vicarious travelers. The Genghis Khan hat is the piece de resistance. With fury in its every fiber it belies your compassionate self. P.S. Gita is not wrong in her count. The 64th step led to your heart. So she’s already in heaven! beautiful pictures….ashok bhai…..thanks a bunch. yet another amazing trip, already seems long ago…!!!!! Ashok, great photos as always. It felt like I was there. I particularly liked the beautiful gold leafed calligraphy. Some of the mosaic work was also stunning. awesome pictures Ashok! – seems like a incredible cultural experience in a less traveled part of the world. You have done one better than Nat Geo! Thanks for you coment, Paul. Your travel outfit sounds fascinating. Please go ahead and use any materials from the blog that you please and thanks for offering to ascribe credit. The slides in the slide show are also uploadable and you can use them if you wish. Fantastic description and pictures! A glimpse into history. Would like to visit sometime. Thanks, Suhasini. Glad you enjoyed the post – hopefully one of a series from our multifaceted trip.